Taylor Sheridan is slowly becoming one of the industry’s top screenwriters, having previously written Sicario and Hell or High Water to high acclaim and numerous instances of awards recognition, including an Oscar nomination for the latter. Sheridan, previously best known as an actor on shows like Sons of Anarchy and Veronica Mars, has also had experience as a director, on the 2012 horror movie and occasional Saw clone Vile, something that is light years away from the grittier and deeply human crime dramas he’s written since then, including his latest film as director (and his first as both writer and director) Wind River – but given the horrific acts of violence and cruelty on display in this film – expertly so, mind you – it’s also a different kind of horror film, one that will leave you astounded and taken aback by how great it truly is. Set in the snow-blanketed environment of Wyoming, specifically in and around the Wind River Indian Reservation, US Fish and Wildlife Service agent Cory Lambert (Jeremy Renner) discovers the frozen barefoot corpse of local Native American teenager Natalie Hanson (Kelsey Chow), who appears to have been raped and beaten but was actually killed by exposure to the snow. Shortly after the authorities are alerted, rookie FBI agent Jane Banner (Elizabeth Olsen) arrives on the scene, dispatched from Las Vegas and woefully underprepared for the freezing climate. Suspecting murder, Banner enlists Lambert’s help in tracking down the perpetrator at any cost, uncovering some dark secrets along the way. One of the many high points of Sheridan’s writing is his ability to craft intense, powerful drama out of the most basic of situations. In Sicario, we were seeing a crooked drug enforcement operation through the eyes of Emily Blunt’s do-gooder agent; there was Jeff Bridges’ weary old-timer Sheriff on the verge of retirement going against two outlaw brothers in Hell or High Water; and now in Wind River, it’s a classic crime procedural movie where the cold environment is about as harsh as the murder itself, possibly even more so. In all those situations, and especially so here, Sheridan presents a scenario that’s been done a lot in other movies and brings something legitimately new and exciting to the mix, with interesting characters with real human depth to get behind, and a growing sense of dread and despair behind every corner. With Wind River, he creates a brutal portrait of the snowy landscapes that offers such rich history, yet is drenched in evil that threatens to undo everything it represents, and it’s extremely well-paced in both the writing and direction that you feel that web slowly untangling with every new shocking turn. It is a disturbing movie, containing some graphic imagery that in the wrong hands could have been portrayed so poorly and in such bad taste, especially one early shock behind a closed door that nothing will prepare you for. It keeps you on edge with its unpredictability all throughout, as you never know what horrifying situation the characters will find themselves in next, or how they will find a way out of it (if at all). But you’re also engrossed because the writing is so strong, the procedure of tracking down and finding the eventual perpetrator while also learning of the horrific events that led to the murder is intense and exciting, and it’s so well-acted by everyone that you just feel the raw emotion that each one of them experiences here. Renner particularly rocks here, delivering some great monologues with some seriously powerful silences and expressions, while also being a total badass when it’s called for, and not once does it feel out of character for someone like him. Since coming into the spotlight with The Hurt Locker he’s been acing it in almost everything he’s been in, but this is easily one of his best performances in years, possibly ever, and it will be interesting to see if Renner actually gets some recognition for this role as we start to approach awards season; it’s unlikely, but then again so was Moonlight winning Best Picture over La La Land in the middle of an acceptance speech, which means that anything’s possible. It can, however, take a little bit of time to really get going, and it wasn’t until the aforementioned shock behind the closed door early on that I became fully invested. Everything I saw before that moment was good, don’t get me wrong, but I was having some difficulty figuring out some of the stuff that was happening, because some of the lines were spoken so softly and quietly it was hard to play it back in my head. When a funny line was being uttered, the noise of the audience’s laughter tended to drown out the next couple of lines spoken after, which I’m not sure is the fault of the movie or the sound system of the auditorium I saw it in, but luckily it really picked up for me quick not long after. This is easily another winner for Sheridan, who now completes his hat-trick of three great back-to-back scripts that have been executed and received near-flawlessly. 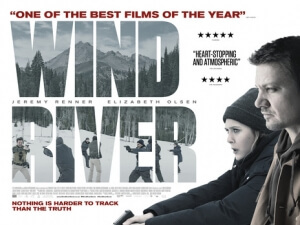 Some people have already labelled Sicario, Hell or High Water and Wind River as an unofficial trilogy of crime and despair in the heart of Americana, but like most people I just happen to see them as three excellent movies that happen to be written by the same guy, and while I can’t say just yet that Wind River is my new favourite out of the three, it’s still an intense, emotional and extremely strong movie that’s absolutely worth your time. Wind River is another triumph for writer (and now director) Taylor Sheridan, who creates a harsh and intense environment with an equally unnerving and unpredictable situation that he executes near-flawlessly, as does Jeremy Renner in a career-best performance that elevates the material to a higher state of being than it already is, making it a crime drama that’s destined to be among one of the strongest and most disturbing in some years.